Home » Unlabelled » My alma mater did it first! Together with some of my colleagues, I joined the University of Santo Tomas (UST) in their attempt of achieving the Guinness Book of World Records' Largest Human Cross. For the benefit of my international readers, the UST is the oldest educational institution in the Philippines. It was founded in 1611, when the Philippines was still colonized by the Spanish Government. The University is celebrating their 400 years of existence and this activity serves as one of the highlights of their founding anniversary. 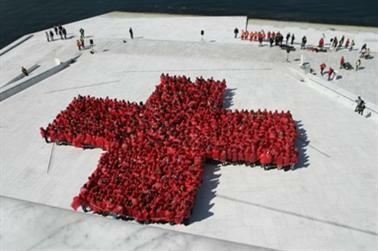 The largest human cross in the Guinness Book of Records is currently owned by Norway. If my research is correct, a total of 935 participants joined this endeavor. 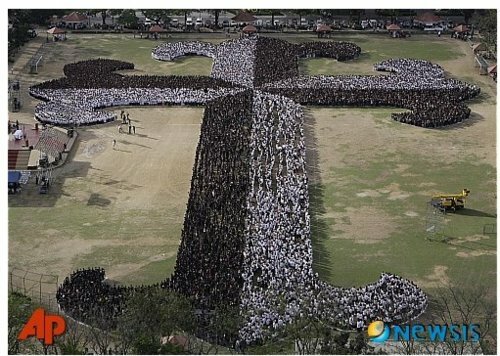 Today, the UST attempted to beat the record of the largest human cross. I was not part of the crowd who made the human cross. I was one of those assigned to provide a manual count and record of at least 50 people who will enter the UST's Open Field. This was the product of all the endless preparations made by the school and approximately 24,560 college students. But before UST, I am proud to say that my own alma mater started this Guiness attempt for schools in the Philippines. 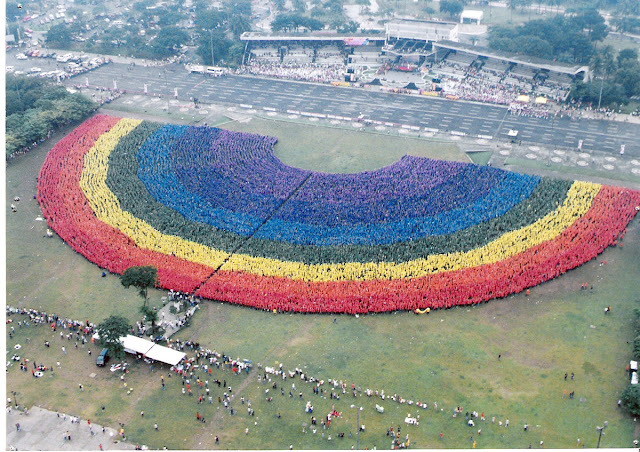 In the first centennial of the Polytechnic University of the Philippines (PUP) - Manila, students, employees and alumni gathered at the Qurino Grandstand to form the world's largest human rainbow. 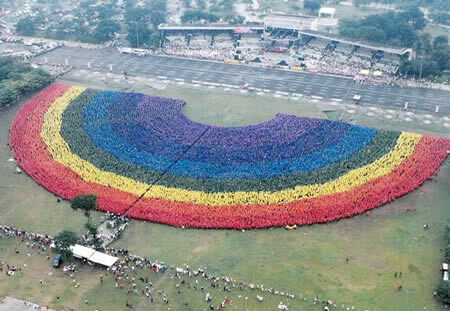 A total of 30,365 particpants formed this Guinness Record for the largest Human Rainbow last September 18, 2004. As of today, PUP still holds the record. You can verify it at the Guinness Book of Records here. ﻿But regardless of whoever school marked the record, the important thing is that the credit goes to my country, the Philippines. WOW this is REALLY impressive - i would to have joined in something like that! PS ... LAST DAY TO Join Custom Sign Give-Away HOPE YOU ALL WILL!